Be the first to share your favorite memory, photo or story of Chris. This memorial page is dedicated for family, friends and future generations to celebrate the life of their loved one. Chris Thomas Mason was born July 3, 1971, in Monett, Missouri, to Billy Thomas and Mary Ann (Johnston) Mason, and passed away sweetly next to his love of his life August 2, 2018, at their home in Udall, Missouri. He was 47 years and 30 days of age. Chris moved with his family to Norwood, Missouri, when he was in 4th grade. He graduated from Norwood High School with the class of 1989 and held the honor of being Class President for three out of four of his high school years. Soon after graduation, he enlisted in the United States Air Force. 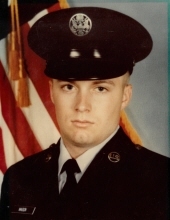 Chris served six years overseas during Operation Desert Shield and Desert Storm. He had the honor of guarding two of the Presidents of the United States: President George Bush in Turkey during their bombing and President Bill Clinton after the Oklahoma City Bombing. Chris took pride in being a United States Air Force soldier and throughout his six year career, received many medals for his achievements. While stationed in Oklahoma City, he met and married Angie Watts. Two children were born to this union, Kyle Thomas and Levi James. Throughout his life, Chris enjoyed hunting and fishing with both of his boys and his friends. Chris was a hunter by nature and an avid fisherman. Chris had many adventures in life and in 2014, he reunited with an old classmate, Medea Reese, and the two became inseparable. They married on February 13, 2016, and made two families into one. Chris was a notorious note writer and after their wedding ceremony, he always left his devoted wife love letters beside their bed, telling her how much he loved her. They completed each other. He took her family in as his own as she did his. Chris was an amazing human being! He’d give you the shirt off his back or his last dollar if you needed it. Material things were nothing to him, as he always spoke of his love for people and just being happy where he was in life. He especially loved just being HOME. He was preceded in death by his paternal grandfather, Thomas “Big Tom” Mason, paternal grandmother, Perla Mae Russell, and his brother, David Mason, last year. He leaves to mourn his passing his loving wife, Medea, of the home, his mom and dad, Mary Ann and Billy Mason of Norwood, Missouri, his maternal grandparents, JR and Grandma Janet Johnston of Norwood, Missouri, two sons, Kyle and Levi Mason of Mountain Grove, Missouri, one step-son, Andrew Reese of Mountain Grove, Missouri, and two step-daughters, Brittanee Rolfe of Mountain Grove, Missouri, and Matracia Friend Springfield, Missouri, nine grandchildren, Jaraven, Lynden, Khloe, Trinity, Everett, Anistyn, Nevaeh, Rydge, and Cora, his mother-in-law and father-in-law, Joyce and Danny Sheppard of Hartville, Missouri, along with aunts, uncles, in-laws, and out-laws, whose lives will never be the same. He was a genuine husband, son, father, grandpa, and friend who will be forever missed by those who knew and loved him. To send flowers or a remembrance gift to the family of Chris Thomas Mason, please visit our Tribute Store. "Email Address" would like to share the life celebration of Chris Thomas Mason. Click on the "link" to go to share a favorite memory or leave a condolence message for the family.